Sign up: Get early updates, free movie vouchers and more! 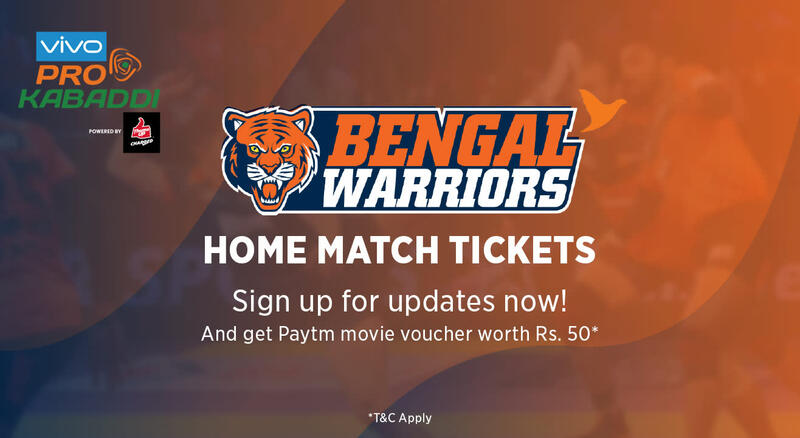 Sign up here and be the first to know when home match tickets for Bengal Warriors go live, and get the chance to grab the best seats in the house! Bengal Warriors had a stumbling start with underwhelming performances in Pro Kabaddi Seasons 1 and 2. Come Season 3 and the franchise reached the semi-finals with some incredible showing. The slump in Pro Kabaddi Season 4 was followed by a 5th Season that had the Warriors get past the group stages but fall short of a Final berth. VIVO Pro Kabaddi Season VI sees the Warriors bring a fresh perspective to their squad while keeping the familiar and important names around. Coach Jagadeesh Kumble will push his team to fight the wars diligently in order to, hopefully, win the final battle.